There are a few ways to copy shifts with Sling. 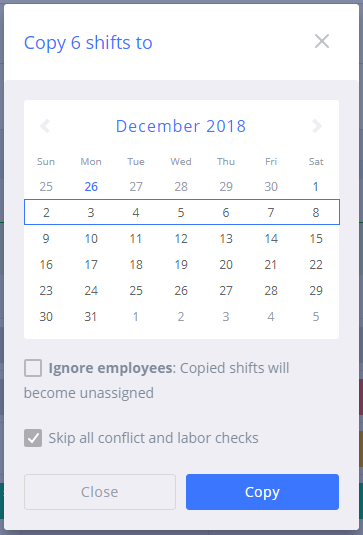 You can copy shifts from any view (Day/Week/Month) and also using any filters available on the left side of the page. To copy all the shifts in view, click the copy button at the top right of the Schedule page. Next, choose the dates you would like to copy from and the dates you want to copy to. Note that you can choose to copy more than one week at a time here. There are also options to revert all the shifts to unassigned shifts, to copy unpublished shifts, and to skip conflicts and labor cost checks. Make your selections, then click Copy. If you would like to keep the selected shifts assigned to the same employee, just leave the Ignore attendees option off as pictured above. Your schedule will be applied to the selected dates as unpublished shifts, allowing you to make any changes necessary before making the schedule available to your employees. 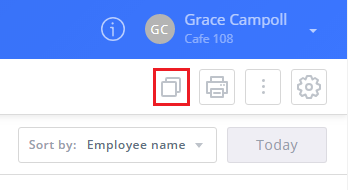 If you only want to copy a few shifts, you can use the check boxes within shifts to select those you wish to include and then use the copy button that will appear at the top left of the page. You will also get the chance to choose which week to paste the shifts to as well as the option to revert them to unassigned shifts and skip conflict and labor checks.